382 pages | 29 B/W Illus. 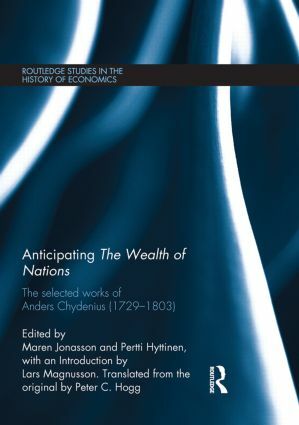 The book consists of eleven of the most important writings of Anders Chydenius, an eighteenth century pioneer of freedom and democracy. Thematically they touch upon subject areas such as the freedom of trade and industry, emigration, the monetary system of the Swedish realm in the eighteenth century, the freedom of the press (or as Chydenius said: the freedom of writing and printing), the freedom of information, the rights of the rural working class and the freedom of religion. The book also includes a comprehensive biography of Chydenius written by Lars Magnusson together with commentaries and explanatory notes to each text. Maren Jonasson is Editor-in- Chief of the Collected Works of Anders Chydenius. She is currently employed by the University of Jyväskylä in Finland. Pertti Hyttinen is Editor of the Collected Works of Anders Chydenius. He is currently employed by the University of Jyväskylä in Finland. Lars Magnusson is full professor and chair in Economic History, Uppsala University, Sweden, member of the Royal Academy of Sciences and chairman of Swedish Collegium for Advanced Study (SCAS).